At Miller Canfield, diversity is more than data. We believe that statistics are meaningless unless the firm is both inclusive and offering real opportunity for lawyers—all lawyers—to succeed and enjoy the rewards they deserve. Miller Canfield has adopted specific programs and measurable diversity goals in the areas of attraction, retention and business development. 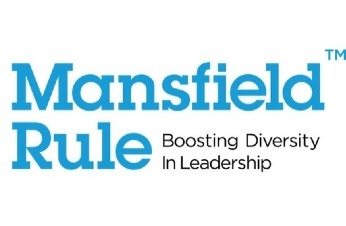 Miller Canfield is the only Michigan-headquartered firm to earn Mansfield Plus Certification, which measures whether law firms have affirmatively considered women and attorneys of color for leadership and governance roles, equity partner promotions and lateral positions. We partnered with Diversity Lab, the national incubator for law firm diversity programs, and received the highest scores in piloting the OnTrack for Leadership program to support the retention, advancement and business development efforts of women and minority attorneys. Four team leaders meet regularly with their respective teams to further discuss and develop specific recommendations to improve the retention of women at the firm. The recommendations are presented annually to the Managing Directors. In addition, we are the first law firm to partner with the Detroit Regional LGBT Chamber of Commerce, and were recognized by OutFront Kalamazoo for our support of the LGBTQ community. We view these programs as the manifestation of the way we live our firm's values. But also importantly, they ensure that we are attracting and retaining the very best talent in the profession, which is good for the firm, our future and our clients. For decades, Miller Canfield has been a leader on diversity issues, both within the firm and in the community. We believe that inclusiveness and diversity are essential to our firm culture and to our success. We are proud that our team of lawyers, paralegals and administrative staff reflects the richly diverse communities in which we live and do business, and we recognize that there is more work to do moving forward. The firm is fully committed to establishing and meeting the most robust diversity goals in the profession. Our commitment to promoting diversity starts with our management team, which has long included the voices of women and minorities. We were one of the first major law firms in the country to elect an African-American chief executive officer, Leonard Givens, who was instrumental in incorporating the Michigan Minority Business Development Counsel. Beverly Hall Burns has served as Deputy CEO of the firm. Our Board of Managing Directors includes Amy Johnston and Danielle Mason Anderson, has included Jerome Watson and Amanda Van Dusen, and was previously chaired by Megan Norris. In 2014, our CEO, Michael McGee, created the position of Director of Professional Development in an effort to ensure that all human capital areas directly affecting and influencing our diversity initiatives are managed in concert with one another. Thus, Michelle Crockett, the firm's first African-American female principal, currently oversees all hiring, diversity, mentoring and professional development of our attorneys. In this role, one of her responsibilities is to lead the firm's Diversity Committee, which is comprised of principals, practice group leaders and a Managing Director, in an effort to monitor and review our recruitment and retention efforts as well as identify ongoing diversity training for attorneys and staff. The Women of Miller Canfield, led by Dawn Schluter, meets several times a year to further discuss and support the practice development goals of our female attorneys. We are a signatory firm of the Grand Rapids Bar Association's Managing Partners Diversity Collaborative Agreement, signed in 2011. The agreement is a formal commitment among 12 major Grand Rapids law firms and the GRBA to collaborate towards achieving greater diversity and inclusion in the West Michigan legal community through education, hiring, retention and promotion. As a firm, Miller Canfield has earned recognition for its inclusivity and support of diversity initiatives, both within the firm and in the legal community. In 2018, Miller Canfield was recognized as a top firm for diversity in the American Lawyer Diversity Scorecard and became the first law firm to sponsor the Detroit Regional LGBT Chamber of Commerce. Miller Canfield was also the only Michigan-headquartered firm to earn Mansfield Certification, which measures whether law firms have affirmatively considered women and attorneys of color for leadership and governance roles, equity partner promotions, and lateral positions. In 2016, Miller Canfield was one of 54 top law firms nationwide selected to participate in the Women in Law Hackathon, an innovative program to advance the careers of women in the legal profession. The firm is an "Honor Roll" member of the Michigan Roundtable for Diversity and Inclusion, and we have sponsored and presented the Outstanding Diversity Award for the Kalamazoo Chamber of Commerce. Three of our attorneys—Amy Johnston, Dawn Schluter and Soni Mithani—have been named by Michigan Lawyers Weekly in its annual Women in the Law recognition and awards. In addition to being recognized for their professional accomplishments, Women in the Law are also recognized for the ways they support other women attorneys. Principal attorneys Michelle Crockett and Harold Bulger were named in the Michigan Chronicle's Women of Excellence and Men of Excellence, which recognizes leaders who are visionaries and who are champions of economic empowerment and diversity. Saul Green was honored by the Wolverine Bar Association and the D. Augustus Straker Bar Association with Trailblazer Award recognitions for his work in paving the way for diversity in the legal profession. He is the co-founder of the African-American Partners Collaborative, which was formed to create solutions to help the legal community attract, support and advance diverse attorneys in law firms. Saul has won the Michigan Roundtable for Diversity and Inclusion's Humanitarian Award and was selected to serve as co-chair of the State Bar of Michigan Open Justice Commission's Task Force on Racial/Ethnic and Gender Issues in the Courts and the Legal Profession. Since September 2017, our attorneys and staff have tutored elementary school students enrolled in Detroit Public Schools through a program initiated by "Retooling Detroit." We monetarily sponsor the computer equipment and software that is provided to the students in each respective classroom. We have sponsored and hosted the Just the Beginning Foundation's High School Summer Legal Institute, which introduces metro Detroit high school students to the legal system and mentors them through the federal court. We have participated in numerous Wolverine Bar Association pipeline initiatives, including but not limited to hiring a minority 1-L law student via the Summer Clerkship and Judicial Externship Program for inclusion in our Summer Associate class, assistance with bar preparation, interview skills, and ongoing mentoring to students. We participate in the African-American Partners Collaborative, which is led by Saul Green and includes African-American partners from all the larger metro Detroit law firms. Members of the Collaborative monetarily support the Wolverine Bar's Summer Clerkship and Judicial Externship Program and meet monthly to discuss and identify opportunities to assist with recruiting and retaining African-American attorneys in the legal profession. We focus our recruiting efforts toward state and national law schools with higher minority student populations, which includes but is not limited to University of Michigan Law School, Wayne State University Law School, Georgetown University Law Center, Harvard University, and Howard University School of Law.